Bee pollen, dubbed a ‘miracle food’, is a nutritionally-rich substance that provides bees with everything they need to survive. Forever sources its pollen from a pollution-free desert using a patented pollen trap which collects pollen without destroying the colony. 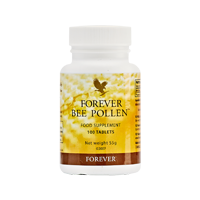 This pollen has then been combined with honey and royal jelly to create Forever Bee Pollen, a fresh and potent supplement. Begin by taking a quarter of a tablet daily, then gradually increase dose to 1 tablet 3 times a day.